Six stories high and with a direct lineage back to the Bauhaus, a new town house in Tel Aviv provide a safe haven from the teeming Israeli city. 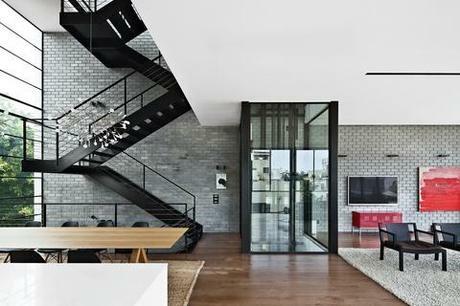 The residents use either the black steel staircase or a glassed-in elevator by Wittur to get around the house; kitchens and ceiling in bright white provide high contrast. Photo by Amit Geron.